How I enjoyed your update! Of course I looked long and hard at Noah’s picture.😀. I remember his squatting down to look out of the lowest window of the door by S. Christians office. Long time ago!! The quilt is gorgeous and the dress is prize winner as well as the “doll” wearing it! Great talent, Karen. God bless you dear friend! Hello Karen. I had wondered what had happened, as I hadn’t seen you pop up in my mailbox 🙂 What a busy summer you’ve had, good for you to put blogging on one side & focus on the important things in life, families are so precious. I’m sure you couldn’t have fitted anymore projects in if you had tried. Your quilt looks a master piece, so much work and all so beautifully sewn. I’m sure now that the days are shortening you’ll soon get it finished. Take care and I look forward to reading more from you. 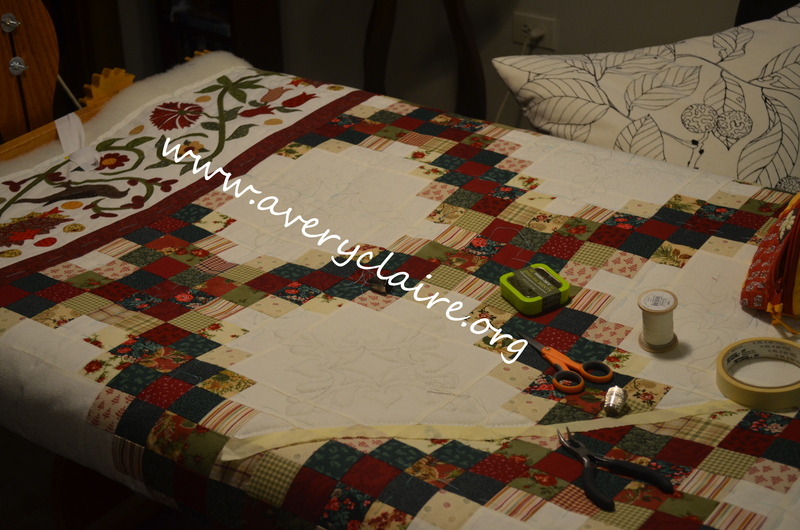 I love the way the quilt is coming along, lots of hard work! 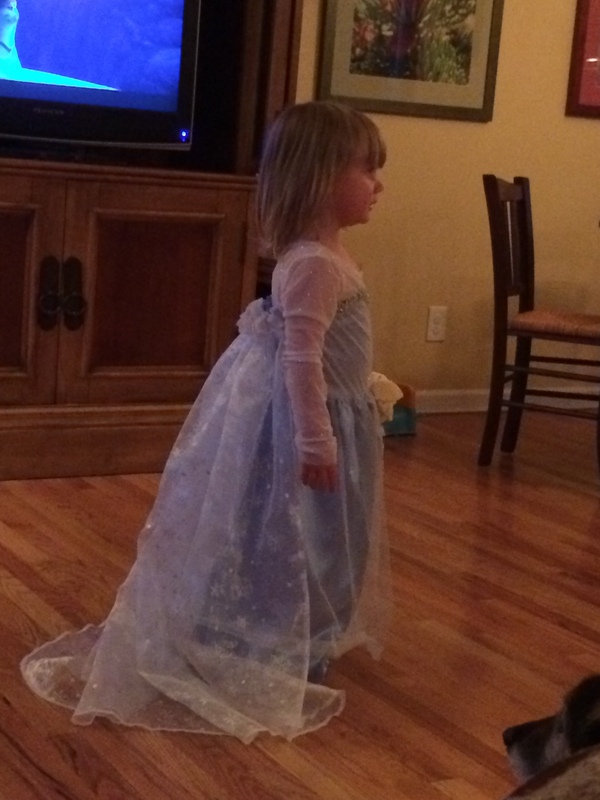 The other pics were great also, including the Frozen Gown for Maya! Darling! It sounds like you’ve been enjoying summer–good for you! The quilt is going to be a treasure! That is a beautiful quilt! I love the border — it’s going to be spectacular when done! Lots of traveling, I see. So nice to be with your grandchildren too. Ouch on your granddaughter’s arm! Love that quilt, and all your photos. You have a very handsome family. Maya looks adorable in that dress! Your quilt is AMAZING! Love the Elsa costume too. I’m sure your granddaughter loves it and feels like a princess wearing it. 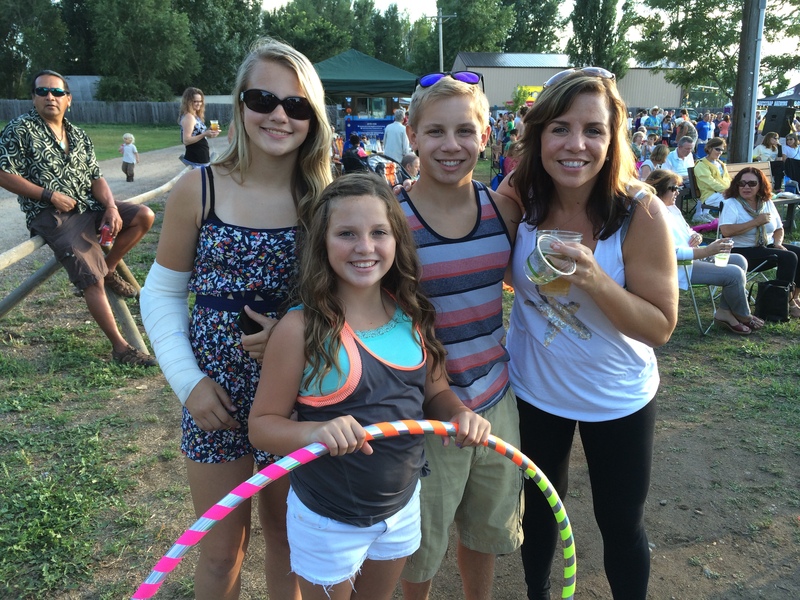 Sounds like you’ve had a busy but fun summer! Your work is gorgeous, Karen! I admire your patience as well. As I said to you last week I do know that you are always busy here and there. And you have a very nice family you can spend a lot of time with. Thank you for the pictures you share. What a fabulous quilt! I can’t imagine doing that much applique and hand work. 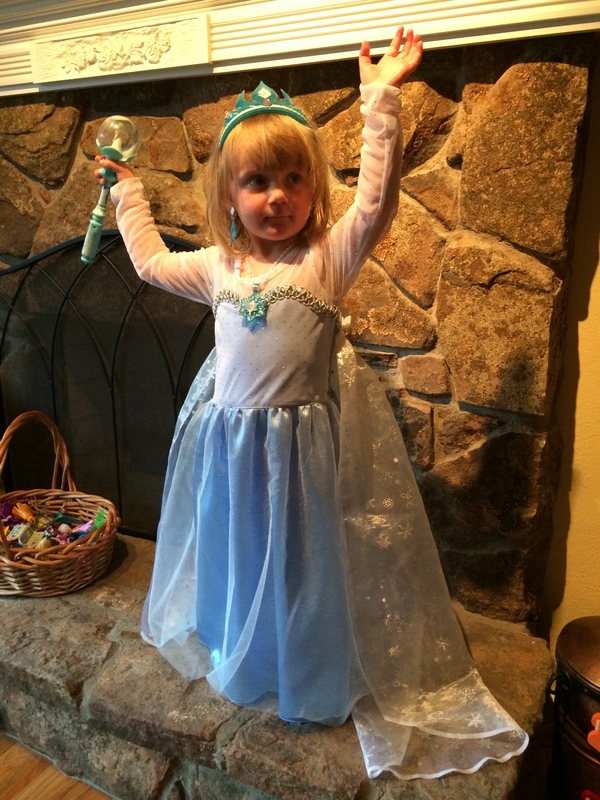 The frozen costume is so sweet and your grand daughter looks beautiful in it. What a fun time you’ve had with the family. Looks like a great crowd to hang out with. The quilt is gorgeous! 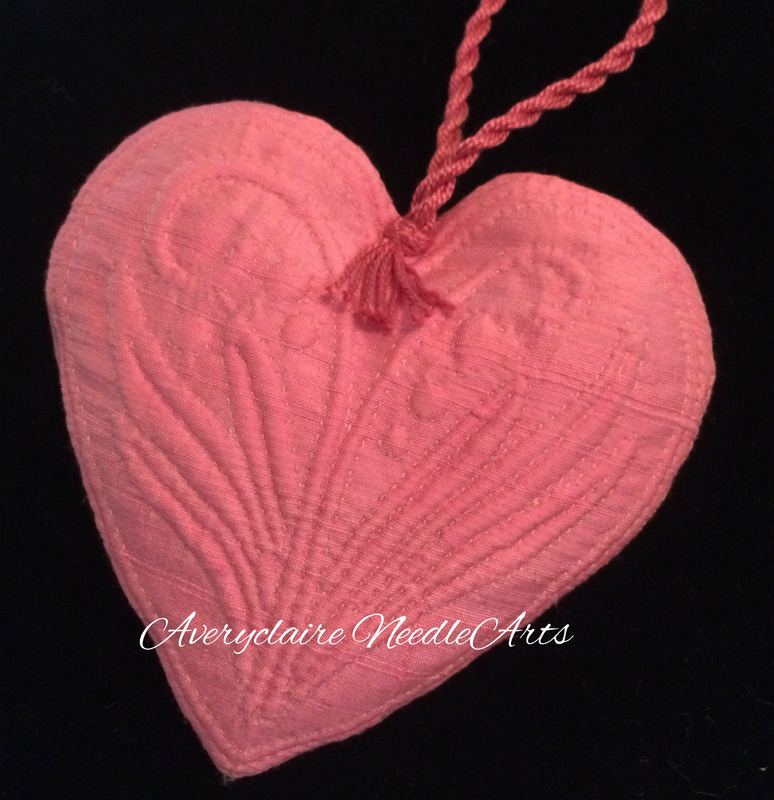 Are you hand quilting it? Your little princess is adorable. I bet she wears that dress nonstop. Yes. Marti…I am hand quilting it. It is a quilt top I did ten years ago and has been waiting for me to design borders. 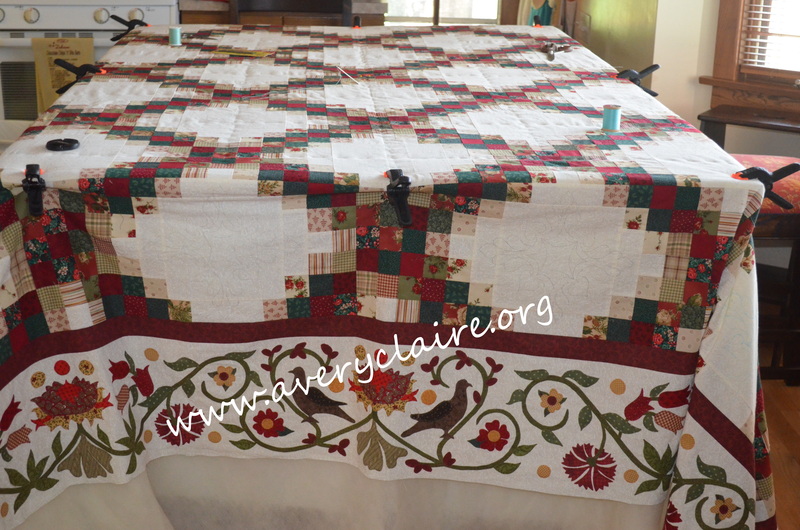 I have two good friends who quilt with me every Friday from 9:30 to 3:00….but it will still take about a year to finish. Maya adores the dress. Thanks. Your quilt looks absolutely gorgeous, Karen! And I love Maya’s dress . . . she is adorable! The quilt is amazing. It’s beautiful sitting in the frame in a warm, cozy room. What fun it would be to come over from time to time and help you and your friends quilt on it. Sigh! Maybe some day! 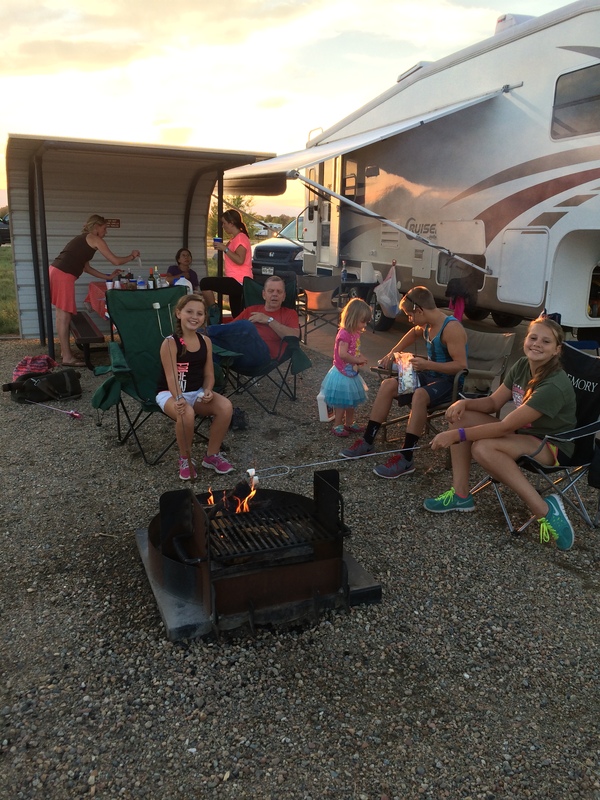 Your family is beautiful and they all look genuinely happy to be spending time with grandma and grandpa. How wonderful for all of you. We have had our first taste of summer, along with reminders of some of the downsides of summer time Downunder, but right now winter has had a relapse and I am looking forward to summer with all those downsides! PS Love the quilt, and the little angel too … and right now that fire would be wonderful! Your applique borders on the quilt are absolutely gorgeous. Very time-consuming but SO worth the time and effort!! What a wonderful heirloom it will be. Your quilt is looking great! Maya’s dress is adorable. I do hope your eldest granddaughter’s arm has healed well.